I love the Sherlock Holmes series. I love the movies, the TV adaptations, the graphic novels. I'm a sucker for Holmes. The adaptations have been very extreme. My favourite (recent) re-imagining of the story would have to be Sherlock. This modern day Sherlock Holmes uses technology as one of his tools to unravel mysteries. What I think the series does very well is Holmes interview style. In the books Holmes always gets his clients to tell a story. His deduction begins with hearing this story. The movies (Robert Downey Jnr) does not do this as much. Instead it uses action as a way to progress the story. Another adaptation is Elementary which places Sherlock in modern day New York city. His faithful companion Watson is played by Chinese American actress Lucy Liu. Interesting choice and I look forward to this exploration. But let's get back to the book. 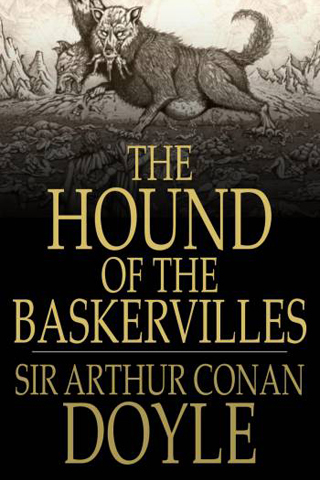 The Hound of Baskervilles was originally published in 1901. It is very different then the Sherlock Holmes case books as this book deals only with one mystery. The casebooks deal with many different stories. Another change in this book is that Holmes disappears from most of the book. Watson becomes the main character and we follow his adventures. Holmes eventually comes back into the story and the mystery is solved in the most wonderfully logical way. Sir Arthur Conan Doyle is a really amazing person. I love how Holmes always uses logic, reason and observation as a way to solve mysteries that seem mythical or other worldly. But Conan Doyle himself was involved in the occult and would dabble in séances. He even believed in fairies for goodness sake.